One of my favorite things to do is help people find a place for their discarded items. I do everything I can to keep items from ending up in the landfill and this is extended to organizing as well. I have found numerous organization in Toronto that work hard to promote and support people and social causes and I do my best to support them. I have put together a page of local resources that I use and thought you might find helpful. If you have any favorites that I have missed add them in the comment section and I will add them to the site. Have a great week! Happy Organizing! Well, this post is way overdue! I have been in the midst of wedding planning, traveling and treading water. The Summer is in full swing! I am really excited about this blog post because it so timely and who doesn’t love camping?! Ok, probably quite a few people don’t like camping, but with a bit of organization and planning ahead you might want to fit a camping trip into your Summer plans. Find a provincial park – they are more reliable than a “no name” camp ground. Clean bathrooms, a must! Click Here for a link to search the list of Ontario Provincial Parks. 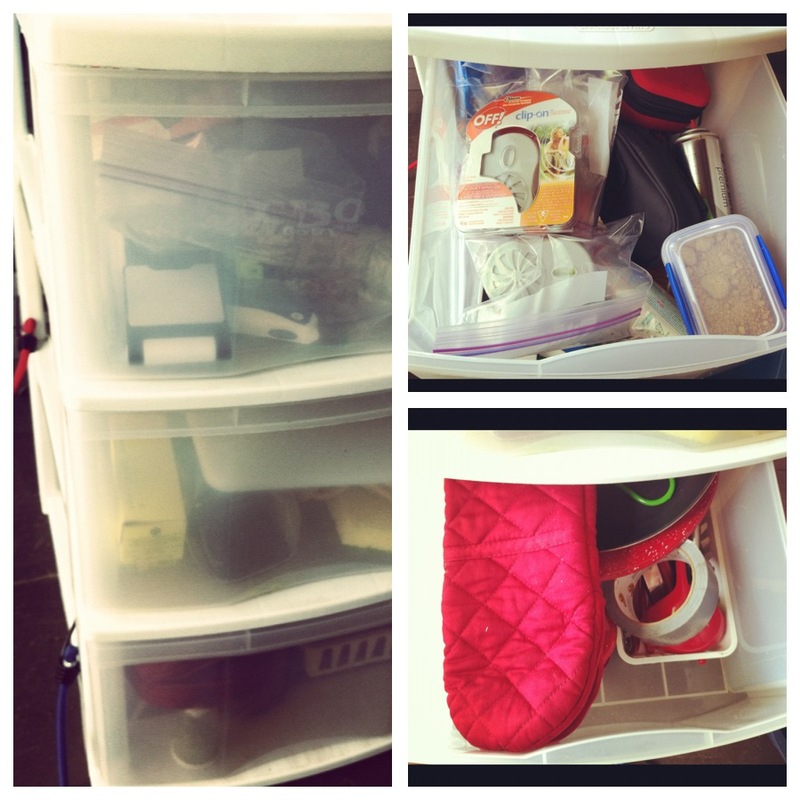 Keep camping supplies separate from your home supplies – My brilliant neighbor keeps her supplies in a plastic three drawer chest. It’s extremely portable and efficient. Set it inside of your tent and everything will be right at your finger tips. Check out the picture below. Prepare your meals ahead of time – Don’t just plan the menu, but complete the prep at home in the kitchen. You’ll be happy you did. Store the food in ziplocs or tupperware and simply open and cook. Great ideas beyond the normal hamburger/hotdog fair is: spaghetti, soups or stews, grilled veggies or make it a mixed grill with your favorite meat, and don’t forget about fish, it’s fabulous grilled! Plan for the time of year – If you go North, June might not be the best time to go, unless you like mosquitos – a lot of them! This is a great opportunity to bond with your children – Show them what it’s like to be entertained without TV, computers, iPads etc. etc. Or show yourself and let them enjoy quality family time! Get back to the basics. I would love to hear your tips and tricks. Truth be told, I haven’t camped in 15 years, but preparing for my upcoming trip has spurred new ideas!